Silver lupine (Lupinus albifrons) is outstanding on the steep, rocky, south-facing slope below the summit. 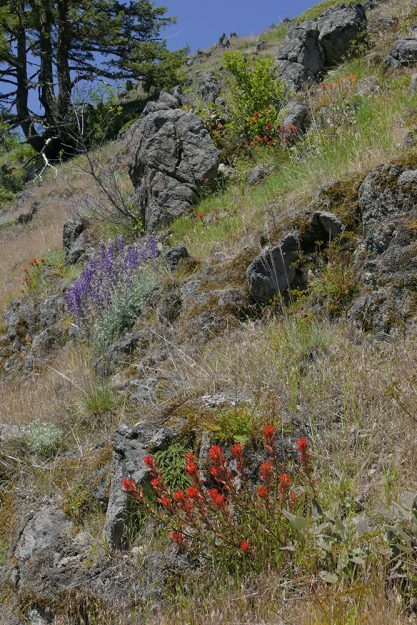 The paintbrushes on the summit are hard to pin down to species just like they are in many spots in southeastern Lane County. They may be a mix of Castilleja hispida and C. pruinosa. Whatever they are, they are gorgeous! Phlox diffusa and Lomatium hallii light up the rocks on the summit ridge. 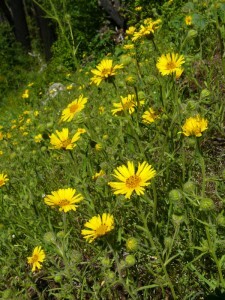 Madia elegans in all its glory. 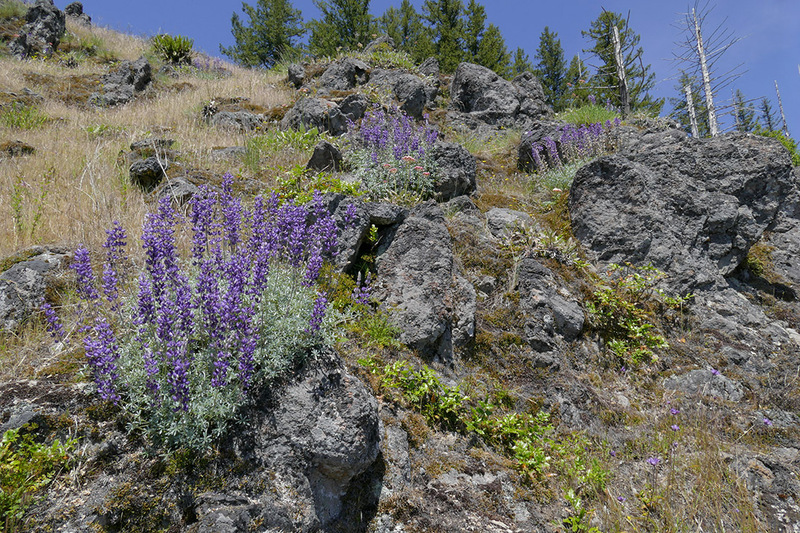 Sunday (May 23rd), Sabine and I led a hike to Heckletooth Mountain, right outside of Oakridge, for a group of folks mainly from the Native Plant Society (NPSO) and the Rock Garden Society (NARGS). We had been thinking about doing this for several years as this is a relatively close-in, easy access hike with a number of wonderful wildflowers. We planned the hike much earlier this year when it looked like it was going to be an exceptionally early spring. As we all know, hindsight is 20/20 vision. The cold spring practically stopped everything dead in its tracks. I did at least have the foresight to schedule a rain date, so people were prepared when we decided to move the hike from Saturday to Sunday. Not only did it rain for much of Saturday, but the snow level came down well below 3000′. 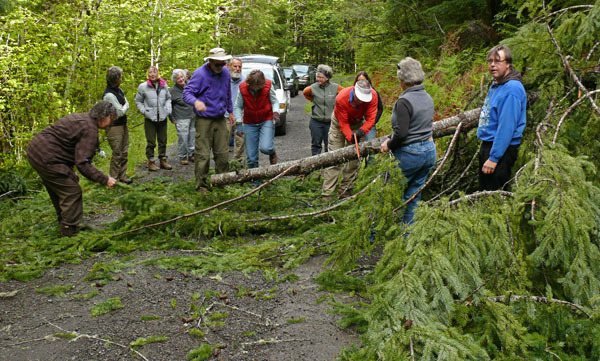 Hike participants made quick work of recently fallen trees blocking the road. As of yesterday, the Dodecatheon pulchellum, Castilleja hispida, and Erythronium oregonum are coming into bloom at Horse Rock Ridge (maybe 2 weeks later than the last few years). The Delphinium menziesii and Fritillaria affinis are still in bud but will open soon. The onions and balsamroot have a ways to go before blooming. The special giant form of Erigeron compositus is near its peak and there are still lots of Calypso bulbosa in the woods. The Mimulus guttatus is really beautiful right now coloring the slopes with yellow, but this hot stretch may dry out those and other seep plants pretty quickly. 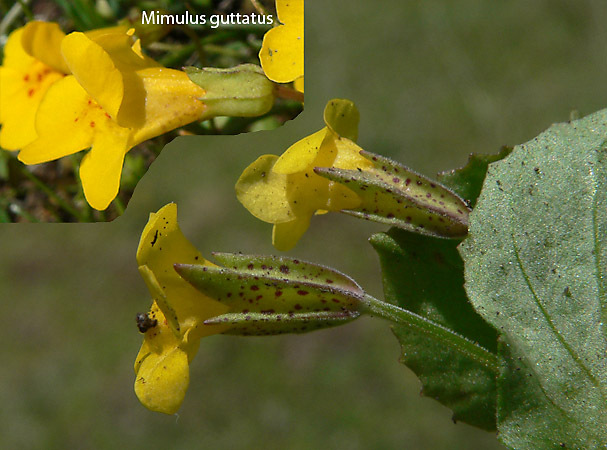 I’ve been studying a strange Mimulus there for several years and took a lot of pictures yesterday (see left growing with Saxifraga rufidula and S. nuttallii). 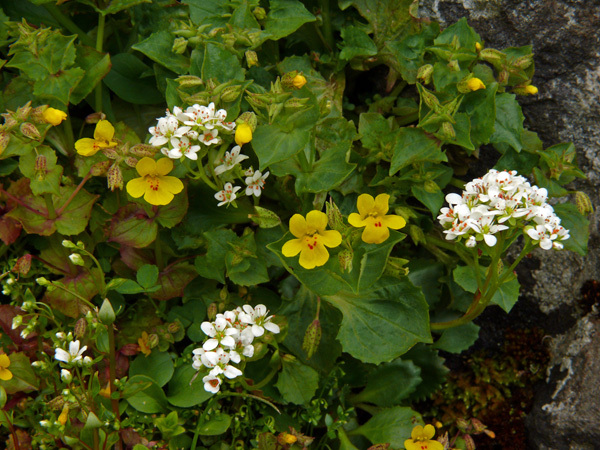 It has small flowers, just a bit larger than Mimulus alsinoides. Its leaves are often quite large. It is only found in the seepy rocks, often under an overhang. 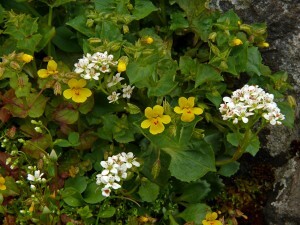 Surprisingly, I saw a couple of plants of the same thing under an overhang in Jasper on my way home yesterday. I’ve also seen it in the same habitat in Douglas County near Twin Lakes. Its upper calyx tooth is the largest, as in M. guttatus, and maybe it is yet another strange form of M. guttatus, but the flower shape is different and there are enough other differences that I have doubts. The calyx of the nearby Mimulus guttatus is angled and basically glabrous while those of this one are deeply pleated, longer and definitely pubescent (photo 2). Of course I find it hard to believe the 3 foot tall ones in wet meadows like Patterson are the same as the tiny-leaved short seep loving ones like those at Horse Rock Ridge and Tire Mountain, and it doesn’t fit anything else too well either. It would be an interesting experiment to grow it and see if looks the same in different conditions. If anyone has seen plants like this or can shed any light on this, please let me know. Sabine and I also went to Heckletooth Mountain in Oakridge on Monday. It is still very early and the thousands of Erythronium oregonum have barely started. 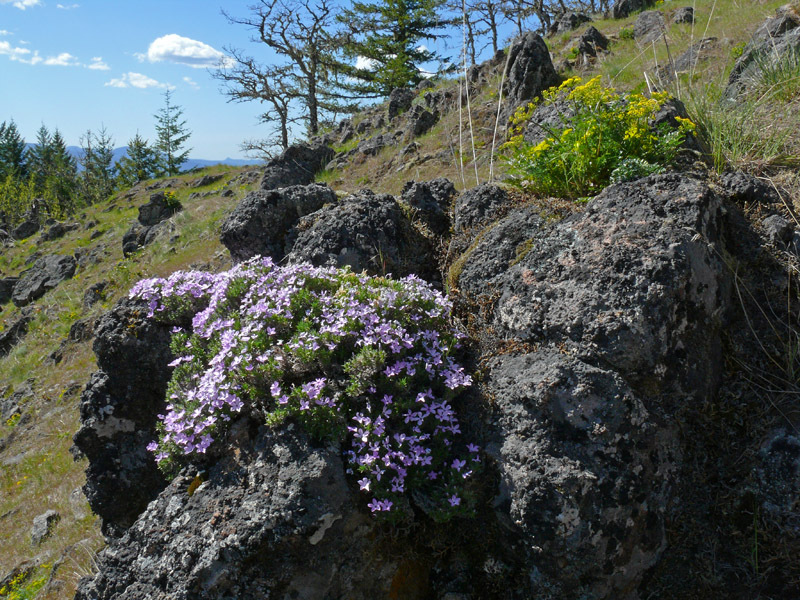 There are lots of beautiful Lomatium hallii in bloom everywhere, lots of Calypso bulbosa, Viola sheltonii, Crocidium multicaule on some of the rocks and fragrant Phlox diffusa at the top. The Romanzoffia californica should be coming out soon. No sign yet of the stunning Madia elegans. Lots of other good stuff to come as well.